"Panoramic View of Burnt District, along Congress Street, viewed from P"
Panoramic View of Burnt District, along Congress Street, viewed from Portland Observatory. Panoramic view of burnt district, looking down (west) Congress Street, from Portland Observatory. Eastern Cemetery in background, left. 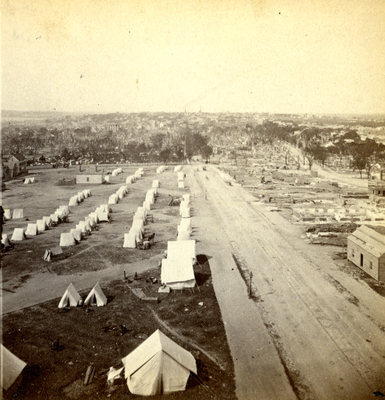 "Panoramic View of Burnt District, along Congress Street, viewed from Portland Observatory." (1866). The Great Fire : 1866 - Stereoscopic views. 24. Portland, Me., Great Fire, Portland, Me., 1866, East End, Munjoy Hill. Congress Street.